I have bought Campbell’s products in the past, mostly because when I think of soup this is the only brand I even consider. It seems crazy to me that Campbell’s could actually be struggling. They are an iconic name in the soup industry, so I feel like they will have no problem breaking into other markets such as juice or skillet sauces. I think this expansion will at least maintain their sales and revenue if not increase them, however I don’t think the impact will be too dramatic. Soup is always going to be their biggest money maker. I am an avid consumer of Campbell, it has great soups and good loyalty. It give me confident to buy its products. I think that Campbell’s expansion of new products will increase its sales and revenue because consumers trust its brand, and they would like to try new products. 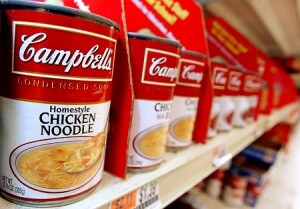 I also think Campbell’s expansion into new product markets will be beneficial for sales and revenues. If companies don’t make changes to their existing product lines in order to satisfy customer needs, then they will fall behind their competitors. With proper marketing and product innovation, expansion for a company can be a good move. This cookbook shows you how to use Campbell’s classic soups as a base or stock for some fantastic meals. The reality is that the classic soups are ‘simple’, ‘unhealthy’, and ‘boring’. Three things people don’t buy today. If Campbell’s want’s to succeed, they need to get away from the old stigmas. Do they need to invent a new product category to do so? Probably not. They could choose to educate the public on how amazing their classic soups really are, but results would not be measurable. This is a marketing problem with legacy. The solution does not require the company to bail on the classics, so why does it seem that way? I have purchased Campbell’s soups before. I think the reason I choose this particular brand is because it had the most shelf space. I do think that this expansion of new products will bring in hype from new and existing customers. Therefore, it will cause an increase in sales. I have purchased Campbell soups and juices before and was not that impressed with the taste. I think the greatest factor that probably caused a great decrease in soup sales are all the recent studies and articles claiming that the excessive amounts of sodium in these soups makes them extremely hazardous. Also, there is very minimal nutritious value in these soups. The majority of them are not made of quality products but of dehydrated vegetables or fatty cuts of meat. The market may have rebounded slightly with the addition of low-sodium options. However as the amount of sodium and other preservatives decreased, so did the taste of the soup. Also, the price of soup went up exponentially. This also probably played a role in de erased sales. As for the sauces, our country invests millions in advertisements, health care and other initiatives to promote better health. I looked at the specs of the sauce and realized how fatty a dans odium prone it is. It’s only a matter of time before the population catches on. A lot of people buy Campbell’s soup products because it’s what their parents served to them as a kid. Personally, I remember my mom serving me Campbell’s soup whenever I had a cold or sore throat as a kid. There is some sort of nostalgia related to purchasing Campbell’s soup. I think the new products will only increase Campbell’s sales. People see the Campbell’s name and purchase their products because they know exactly what they are getting. So the new products not only create new markets, but also create new products for their current customers to buy, which will drive up sales. I wouldn’t call myself an avid consumer of Campbell’s, but I definitely buy their soups every so often. I think the reason for choosing Campbell’s is the company’s brand name. I know that I will find it in most grocery stores near me, and the brand recognition gives it a sort of quality assurance. I believe that the new products will increase Campbell’s sales and revenue. I think the brand recognition will help because people know it is a good brand, trust it, and will be more willing to try out the new products. I never realized it, but my family is an avid Campbells consumer. We continually go and purchase Campbells soups because of their much promoted health effects. Just recently, we purchased three V8 bottles and nearly 10 cans of various soups. It is not just the health benefits, though. We also enjoy the taste that Campbell’s soups bring with it. I believe that Campbell’s strategy of maintaining low costs while improving flavor is a good idea. However, what happens when their flavor cannot be improved upon? In this instance I think that they will have to enter into other markets, like they are doing, in order to maintain their going concern status. This will undoubtedly bring them greater profits. But as they reach their highest level of flavor, their profits will eventually even out, and if they are not careful, they will begin to incur great losses.